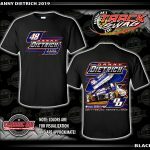 GETTYSBURG, Pa. (March 18, 2019) – For the first time in 2019, Danny Dietrich and Gary Kauffman Racing are main event winners in Central Pennsylvania. The victory, a third consecutive podium finish for ‘Double-D’ in the Keystone State, was worth $3,500. Although the nearby-Gettysburg native started from the pole position, it was not an easy victory, as the former Lincoln Speedway track champion lost command to Anthony Macri during the early stages of the main event. Although Macri was seemingly in control, Dietrich tracked him down in a hurry, actually battling back within a car length with just three laps remaining. As the top two entered turn one on the final circuit, Dietrich dived to the bottom of the speedway, desperately attempting to slide in front of Macri as the pair exited turn two. The move worked perfectly, sealing the deal by blocking the cushion at the entrance of turn three. 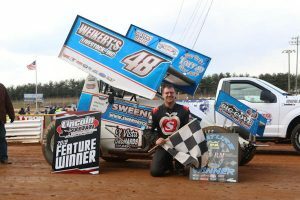 Danny Dietrich capped off his recent weekend with the Williams Grove Speedway season opener on Sunday afternoon, March 17. Nearly attaining the weekend sweep, Dietrich was a close second at The Grove, finishing just behind Lucas Wolfe after starting ninth on the grid. Actually, Dietrich caught a break early after Steve Buckwalter failed to take the green; Dietrich moved ahead one row to start seventh. Dietrich and Gary Kauffman Racing will continue their 2019 campaign with an upcoming weekend schedule much like the last; visits to Williams Grove Speedway and Lincoln Speedway on Friday and Saturday, March 22 & 23, respectively. Danny Dietrich and Gary Kauffman Racing would like to thank all of their current marketing partners including: Weikert’s Livestock, Sandoe’s Fruit Market, Pace Performance, Big Cove Whitetail Trophy Hunts, Drop Of Ink Tattoo, Sweeney Cars, Self Made, Graver’s Garage, Racer’s New & Used Parts Warehouse, Bear Mountain Orchards, El Vista Orchards, Moritz Machine & Repair, Bream Orchard. 2019 Highlights: Finished third during Lincoln Speedway’s Icebreaker on March 10. Earned victory at Lincoln Speedway on March 16, runner-up finish at Williams Grove Speedway on March 17.